We've all seen an inch worm before, but how about a 420" caterpillar? That's right, 420" of fun for kids. Climb right into the mouth and enjoy the slide down into his belly. Jump in his belly as much as you want, then climb and slide your way out! 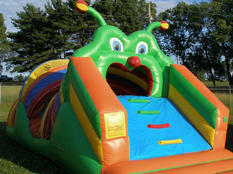 Kids do not want to miss out on this adorable caterpillar obstacle course.